Interactive learning quests, book reviews, lesson plans, teacher tools and technology tips for teachers. 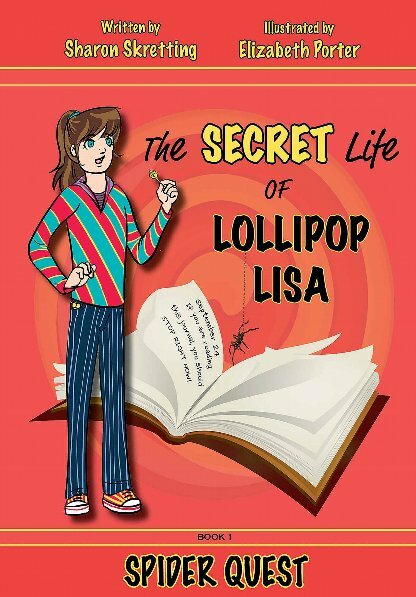 Lisa is an independent strong willed fourth grader who isn’t afraid of being different. She does not conform to the crowd in the way she dresses or how she expresses her opinions. Lisa received the nickname Lollipop or Lolli because she does enjoy eating lollipops and because they are as colorful as her appearance. When Miss Warner decides that the class will keep a daily journal, Lisa is reluctant because she is afraid someone will read her private thoughts. After thinking about it, Lisa decides she will solve that problem by keeping two journals, the second one to record her private thoughts. Unlike the other girls in the class, Lisa is not afraid of the spiders kept inside a jar. One day, they escape from the science corner and screaming chaos erupts inside the classroom. Once Miss Warner establishes order, the students put their minds to work employing all the things they learned about spiders in order to find them. They discuss how spiderlings hatch, the kinds of food they eat, where they hide, how they molt, and the way spiders move from place to place. Will Lolli and her friends use their smarts to find the missing spiders? If found, what should they do to prevent their escape in the future? In reading this adventure, one discovers a lot about spiders and the reasons we should not be afraid of them. This book is recommended especially for children ages seven to ten. It is an excellent choice for reluctant readers because the length is manageable and the pictures make it easy to follow the text. As an added bonus, both students and teachers are given the opportunity to download their very own secret journal. Get our exciting newsletter delivered to your email inbox. Please enter your email address below. Give students feedback using your voice! Sumo Paint – Like free Photoshop! Technology For the Teacher: I Love this Teacher Tech Site! Engaging Students – Rocky Mtns. Don't Call it A Dump!